Theseare WHOLE organic blue lotus flower petals, hand-picked from a single pond, ona small farm in Nepal. The sacred blue lotus flower (Nelumbo nucifera) has become etched in folklore because of a fabulous people who supposedly occupied the north coast of Africa and lived on the lotus. The sacred lotus flower was also what Ulysses' crew smoked after coming ashore following years at sea. 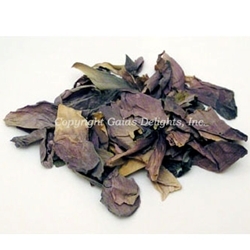 Sacred blue lotus contains lotusine, demethyl coclaurine, neferine, and nuciferine. These are WHOLE organic blue lotus flower petals, hand-picked from a single pond, on a small farm in Nepal. The sacred blue lotus flower (Nelumbo nucifera) has become etched in folklore because of a fabulous people who supposedly occupied the north coast of Africa and lived on the lotus. The sacred lotus flower was also what the Ulysses' crew smoked after coming ashore following years at sea. Some believe that the lotus came to India from Egypt. Later, Buddhism borrowed the flower from Hinduism. In Buddhist painting and sculpture, whenever Buddha is shown delivering an important sermon, he is shown sitting on a lotus pedestal. Buddhist scriptures enumerate fragrance, purity, delicateness and beauty as the attributes of lotus. The lotus is one of the world’s most celebrated flowers. From time immemorial to the present day, it has always been found in folklore, religion and the arts in one form or the other. The term lotus is applied in general to several species of plants. About 100 lotus species are found in temperate regions of Asia, Africa, Europe and North America. The pink- and purple-colored variety widely used in religion is Nelumbo nucifera. Scriptures tell us that it first bloomed with the creation of the universe. Over the centuries it has lost none of its allure. According to yoga and tantra, there are seven lotus wheels in the human body. The lotus is the object of meditation in tantrik Buddhism. The lotus motif has also been extensively used in the shrines, art, architecture, and sculpture of the Jains. The Ionic order of architecture of the ancient Greeks is an offshoot of the Assyrian and Phoenician forms which have the lotus as their basis. Nelumbo nucifera is an edible species. Its seeds are roasted to make puffs called makhanas. The plant’s rhizomes are a source of lotus meal which is rich in starch, and its American counterpart, Nelumbo pentapetala, was a source of starch in the diet of the American Indians. A number of wild animals feed on the plant, and fish find refuge in its underwater stalks.